Guy and Sharene Wood’s family business is one of uptown Manhattan’s best-kept fashion secrets. The Woods, both born and raised in Harlem, are the founders of 5001 Flavors and Harlem Haberdashery. 5001 Flavors is their family’s manufacturing business, which is celebrating its 25th anniversary. Guy Wood, the company’s head designer, has been designing custom clothing and accessories for celebrities and athletes since its inception in 1992. Harlem Haberdashery is the family’s retail store, which is celebrating its fifth anniversary and serves as the exclusive retailer for the Wood family’s collaborative brands. The boutique sells custom clothing, shoes and accessories, with a Harlem Renaissance vibe. This vibe is readily apparent and woven throughout the boutique, which includes framed black and white photos from the Harlem Renaissance as well as the Wood family’s historical photo collection. The boutique is a family experience. Since the family is from Harlem, it’s like walking into their family home with the rich legacy and tradition of Harlem. Our writer, Theresa Majeed asked the Woods, Guy and Sharene, questions about their secret to creating such a successful retail business for all these years and especially now. “My mother was a seamstress and used to take me with her when she picked out fabric. I didn’t realize I was actually learning the texture and weight of fabric at a young age. I was learning aspects of the business without even knowing it,” explains Guy. This experience led Guy to design his first shirt, which led to the creation of more custom looks, and ultimately an invitation to design for prominent music industry artists. At what stage did the celebrity component of your company enter the business? “The custom looks I created eventually led to invitations by music industry executives to create similar looks for their artists, resulting in word-of-mouth referrals to other artists and projects,” explains Guy. Through these relationships, one client turned into five, which eventually turned into 50. Ultimately 5001 Flavors gained behind-the-scenes notoriety by creating iconic looks, which included extraordinary leather ensembles for music icons like the late Notorious B.I.G. It was during the height of the 90s music video era that Guy found himself designing custom looks for videos and artists, including Sean “Diddy” Combs and his Bad Boy Label roster, Kid Rock, Fat Joe and many others. Later their client roster grew to include Vanessa Hudgens, Rick Ross, DJ Khaled, Aerosmith, Jay Z and Beyonce.The company has also designed for iconic athletes, including LeBron James, CC Sabathia and David Beckham, to name a few. What is the best part of working together in a family business? “We get to speak with each other everyday, and not just when we get home,” says Guy. The business is truly all about family. When you visit their factory in the Bronx, you see the entire family at work creating and designing, from Guy and Sharene’s son and daughter to brothers and nephews. Everyone in the family has their own sense of style, and has developed their own clientele and brands that can be seen at Harlem Haberdashery. What differentiates 5001 Flavors from other companies in the industry? As the company has become more seasoned, the family’s next generation is carving out its own space. “Fashion is changing so rapidly now, so you must keep up with the trends and with innovation. You are only as good as your last outfit. The younger generation comes in and wants to talk to my son. You have to understand the youth are the future. We must give them their own space to create,” says Guy. How has your company sustained its business through this tough retail environment? The couple, who have been married for 10 years, explains they try to keep innovation at the forefront of their company. They also do small runs, and don’t make more than five pieces per collection. “My wife is the visionary. It was her dream to create a retail space, and she didn’t give up until it happened,” states Guy. Sharene is the glue that holds things together in her role as administrator and CEO. He explains they’ve always had to stay a step ahead of current fashion trends. When white tees were no longer the craze, they added pockets. They went from jerseys to tracksuits then to suits, tuxedos and ball gowns. They make sure their custom clothing doesn’t look like it was bought off the rack. A big part of their success was never listening to the naysayers who said they couldn’t make it work. It worked because they had to make it work. The family also believes in developing long-standing relationships. Today they are still working with the same tailor that started with them. Since it services mostly private clients, their collections fall outside of the typical fashion seasons. Harlem Haberdashery feeds off of trends, while catering to the needs of its clients. The collection is not typical, and features collaborations with their family of brands. Harlem Haberdashery offers exclusive limited edition collections for their celebrity clients. What are your upcoming goals for the business? Sharene explains that they would like to collaborate with a strategic partner that can help them expand their business into a full fledge lifestyle brand, which includes home, kids, fragrance, beauty and women’s. What are your retail price ranges and some highlights from the boutique’s current collection? Harlem Haberdashery caters to all budgets, from tees and accessories at $30 to custom clothing starting at $3,000. For men, uniquely designed stylized jackets and denim. They have a multi-camo look, which seems to be woven into many of their pieces, and is a family favorite. For Women, stylized dresses. 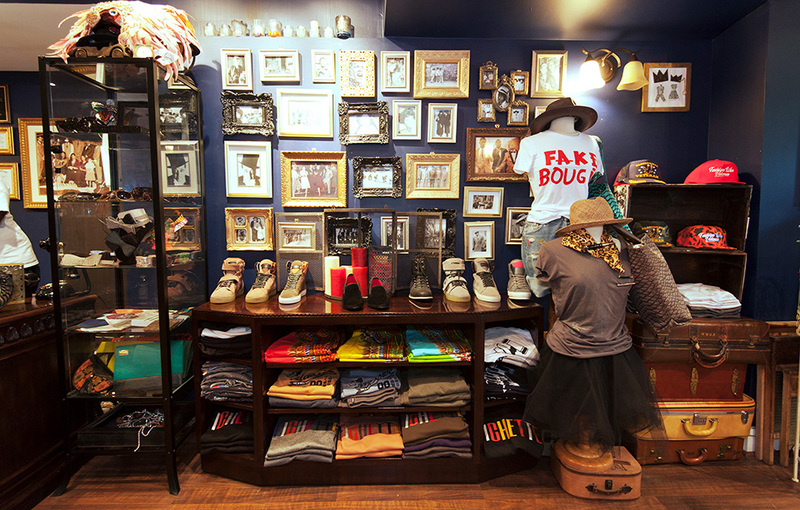 The boutique’s clothing is 80 percent men and 20 percent women. Most of the male clients come in for complete wardrobes, unlike their female clients. Is the collection sold only in your Harlem Boutique, or in other retailers as well? Right now, everything is sold exclusively at Harlem Haberdashery. There’s also a small specialty 5001 line sold exclusively there as well as online at HarlemHaberdashery.com. We are looking to expand to other retailers in the near future. The company also has some pieces in the Rock & Roll Hall of Fame that exhibits iconic looks from album covers and celebrity pop culture, which shows the importance of hip-hop culture, and offers a time capsule of the best kept fashion secret in Harlem.